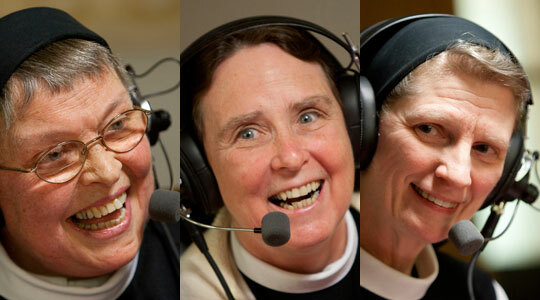 Today’s guest(s): Mother Maureen, Sr. Evelyn, Sr. Katy, Sr. Janice, and Sr. Pamela of Mount Saint Mary Abbey, Wrentham, Mass. Summary of today’s show: They say it’s the best kept secret in New England and along a quiet, tree-lined road in the rural town of Wrentham sits an unassuming monastery of contemplative women who make chocolate beloved around the world. Scot Landry goes on location to Mount Saint Mary’s Abbey, where the Trappist nuns support their way of life by making and selling Trappistine Quality Candy (perfect for Christmas gifts!) and practice the Cistercian life of liturgy, labor, and lectio divina. Join us on a rare behind-the-scenes look at life in a place where life moves at a different pace. Mother Maureen, Sister Katy and Sister Evelyn join us today. Scot asked Mother Maureen about the origins of the Cistercians. The order was founded in 1098 by Benedictines living in a culture that didn’t allow for the full expression of the Benedictine way of life. These monks missed the manual labor as well as the solitude and prayer that comes with less involvement in secular affairs. So they went off into the thick woods of France with the Church’s blessing to work the land and find a purer balance of the Benedictine way of life: Liturgy, labor, and lectio divina. This way of life took off like wildfire. Scot said at some point the Cistercians underwent a reform which resulted in the Trappists, formally called the Order of Cistercians of the Strict Observance. Mother Maureen said the order looked back to its roots which helped it to survive difficult times, including the French revolution. Scot said there are other Cistercians abbeys in the US, including 12 for women. Sr. Katy said there is usually a monastery of nuns located near a monastery of women. The Abbey in Spencer, Mass., was already here and then Cardinal Cushing in 1949 asked for the sisters to come from Ireland to found this monastery. The numbers grew very quickly and they began to make foundations elsewhere. The first was in Iowa and the second in Arizona and third in West Virginia. Scot said they take a vow of stability. They promise to stay in the abbey for the rest of their life. Sr. Katy said the exception is if they make a new foundation, but if they come it’s their intention to stay in the community until death. It’s a blessing to have that continuation. It’s a little bit of heaven because we believe after death we will be together forever. She said they never get bored with one another because they’re always changing. Scot said there are 45 nuns in this monastery. Sr. Katy said they’re starting to see young women come to visit again. They don’t like to take them too young because the life is quite radical and so they would like them to have some maturity. Mother Maureen said about 1/4 of the nuns are from New England and 1/4 from the rest of the United States and since the 1990s they’ve had many more from overseas, so about 1/4 are from 10 different countries. And if they count the ones in the cemetery, about 1/4 are from New York state. She said there are more monasteries of men than women and there are some countries with Cistercian monasteries for men, but not women, so women who are interested in the monastic spirituality in the life will seek out the community. Scot said when they make a vow of stability to this community, they are leaving behind their country and they are discerning God’s will that this community is where they will stay the rest of their days. She said when you have people from a number of cultures living together, it relativizes the culture and brings you to the essence of religious life. Scot asked how the diversity of background adds to the life. Sr. Katy said they are gifted and blessed to have so many cultures involved here. God has a wonderful sense of humor and a wonderful treasure he gives to us not just in accepting the other, but in being accepted and being able to live together. You come for one reason: to live for God. Other reasons can include the life of prayer, the life of work, the life of community, but in the end when everything else falls away, the one thing you have left is God. That is proven when you have so many people from so many cultures. Scot said when you live a life of stability with a very regimented schedule, that might not appeal to someone coming from a busy life. He asked Sr. Evelyn as the novice mistress how she helps seekers to adjust to the life of the abbey. She said when someone does come, most of the time they’re very grateful for the simple life and they say to themselves they don’t know how they dealt with the old way. Most who come have already started to live a prayer life outside and have had to give up a lot of their activities so when they come they plunge in. After a while, when you have a routine, you start to live within and the adventure is really within. You realize that God is really the adventure, because he’s speaking to you in this quiet life. Scot asked Mother Maureen how she discerned her vocation. She said her father gave her the book the “Seven Storey Mountain” by Thomas Merton when she was 15. Her dad loved Dorothy Day, who played a big part in Merton’s life. When she finished the book, she realized that it was a mirror of a desire she didn’t know she’d had. When she told her dad, he said it wasn’t why he gave her the book, but it was too late. It was a seed that grew in her. Scot asked Sr. Katy about her vocation. Her parents were very supportive of what she wanted to do in her life. She’d been in an another order for a number of years before coming to the Trappistines. As a little girl she’d wanted to be a sister, but that got put on the shelf during high school. As she came to graduation she felt God pulling her in this direction. She also tried nursing and entered the Daughters of Charity of St. Vincent de Paul and was with them for years. That community would often go to a nearby men’s monastery for Mass and prayers and felt a growing call for the solitude that was there and the vocation came from deep within and there was nothing to do but follow it. She loved the Daughters of Charity, this was the right move to make. She’s never regretted it. Sr. Evelyn is Scottish and came to Canada with no intention of entering a monastery. She got the call as she left Scotland. She desired to love God as much as she could and she went around to all kinds of other active orders, but she had a desire for the contemplative life. The person helping her thought she was too extroverted for contemplative life. The book that really struck her was the book “The Man Who Got Even with God.” She was told that she should go to America rather than stay in Canada because she didn’t speak French. She finally came to the abbey and the day she walked in the door,she knew she was home. Scot asked her how an extrovert can live a life of silence every day. She said the silence was what attracted her because the silence helps her to pray. She’s a talker, but what she really loves most is the silence. 2nd segment: Scot said life in the abbey is about Liturgy, Lectio Divina, and Labor. The liturgical life includes seven times of prayer each day. Mother Maureen said St. Benedict loved the phrase from the Psalm, seven times a day I have praised you. The figurative meaning is giving the life wholly in praise. They rise before dawn, at 3:20am, to begin the day with prayer. This is key to Cistercian spirituality, rising in the night to meet with God. All the activities of the community revolve around those hours of prayer, so each part of the day is blessed by liturgical praise. Scot asked the other times during the day they pray the Divine Office. Mother Maureen said Morning Prayer is a 6:30, followed by Mass. They have three little hours and then a solemn evening hour of Vespers and then Compline at 7:15 at which time they go to sleep. All the prayers are in the chapel in community, except the Ninth Hour, at noon, which is prayed wherever they are working. Scot asked Sr. Katy about Lectio. She said Lectio Divina is one of the most important aspects of their life. It includes Scripture reading. It feeds the heart and soul. It’s different from reading a book to study or for pleasure. It goes to the heart and it’s never finished and can never be replaced by anything else. You carry the word or phrase you receive throughout the day and comes back to you as they day goes on. Some sisters use the readings from daily Mass for Lectio. Not everyone uses the same readings. Scot said his sense is that it’s deep, slow, and short reading. Not a chapter in a book, but a paragraph or sentence. Sr. Katy said it’s important to read it slowly and several times. A word might catch you or a phrase and it’s important to stay with that. Sometimes nothing comes and that’s okay too. God can speak in the silence. Scot asked for what they could tell listeners to integrate it into their own prayer lives. She suggested setting aside a particular time of day, perhaps in the morning. Don’t feel you need to read something in its entirety, take it slow. Read it over and over again. Try to carry it with you throughout the day. Scot asked Sr. Evelyn why Labor is such important part of the life of a Cistercian nun. She said part of their life is to live by the labor of their hands. They’ve chosen that they want to live by their labor and take care of their own needs. Different aspects of life have different labors. There is a prayer in work that reveals what’s going on in your heart. You are in prayer, you are in one place. When you’re in work, it reveals the depth of character, especially when things don’t go well. Being able to see work as a gift and to offer your whole heart in your work can amplify the prayer before or after that. Scot asked what forms of labor there are at the abbey. In addition to candy making, there is the office work they do. They have a flock of sheep to care for and groundskeeping and building maintenance. There is plenty of cooking, housework, and taking care of the sick in the infirmary. They have a bindery and a shoe shop as well. Scot asked Mother Maureen if the sisters rotate among the jobs or stay at one job. She said they do try to have a balance of detachment and using people’s gifts. Some of the work is more technical so a person who has work like that, like actually cooking or treasurer has to have certain skills. It varies, some keep their jobs longer than others. There is a common good and a personal good and they try their best to balance those. Scot asked Sr. Katy how a woman might want to discern whether this is the way of life for them. Sr. Katy would invite them to a monastic weekend, which they offer twice per year. It gives them an overview and closeup view of the way they live. If the woman and the community feel it might be prudent for them, they invite them back to live in the guest house for about a week. The next step is for them to come inside and live with them for up to six weeks. After that would be acceptance into the order as a postulant. She said she makes clear that their number one work is prayer. They don’t work in schools or hospitals. 3rd segment: Scot welcomed Sr. Janice, who oversees the business operations of Trappistine Candy. He said we’ve learned that labor is one of the ways the nuns grow in their faith. He asked her about the candy business here. She said they make a variety of candy and offer them in various combination. Their bestseller is butternut munch in milk chocolate and dark chocolate. They also make several kinds of fudge. They also make milk and ark chocolate squares. Scot asked what makes it unique. Sr. Janice it’s made with love and prayers and when they make it they remember those who supply them with the goods to make it or support them by purchasing it because it supports their life and vocations. People can buy it at the gift store, but they can also purchase it online. Sr. Janice said their candy has gone to every continent, but Antarctica. The bulk of their business is domestic and have many customers who use their candy for gift-giving. Some people from far away have heard about them and found them online and just buy the candy. If people wanted to order the candy, they can go to TrappistineCandy.com or call 1-866-549-8929. They sell well more than 1,000 orders at Christmas. Scot said it’s obviously well more than 1,000 by the humble look on Sr. Janice’s face. Scot asked her what the one thing about she wanted to share about their candy. She said the sisters have a contest to see which state purchases the most candy: It’s usually Massachusetts or New York. New York won once, but Massachusetts has carried the pennant for the past 40 years. 4th segment: Scot welcomed Sr. Pamela and she is the new media expert in the abbey. He asked how embracing new media is part of their work. She handles the website and Facebook page for the abbey. She also troubleshoots anything in the monastery as well. They had their first website back in the 1990s, as soon as it was possible. It’s been important for their work, not just for vocations, but also for supporting the general Catholic population. They have visitors from all over the world and there’s a general hunger among people to find the authentic Christian life. It has helped with vocations. If the website wasn’t there they would think the sisters out of touch. She said, if used properly and with discretion, Facebook is a way to evangelize. They use it to reach not just family and friends, but all people interested in their life. She often posts about events and photos. She posts prayer requests, summaries of homilies, and the like. People sometimes submit prayer requests through the Facebook page and through a form on their website. Scot said they also have a Flickr.com page and there are a lot of photos from recent events at the Abbey. Sr. Pamela said they just opened it this summer. As a Mac user she had been using a .Mac account, but since that is closing, she’s moved to Flickr. Scot said being able to communicate with the outside world connects what they do here in the community with the universal Church. She said when people do come here to visit they often comment on that connection. Mother Maureen finished by saying that every Christian has a call to reflect the life of Jesus in some way, but no person or group can exhaust the mystery of Jesus. They are called to express the love of Christ in their life of community. Each person’s journey in their prayer life is uncharted, but it is all about entering into the heart of Christ and his prayer.